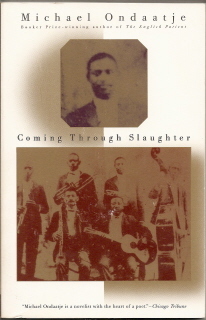 Coming Through Slaughter is also one of only two or three North American novels published in the 1970s to include photographs. 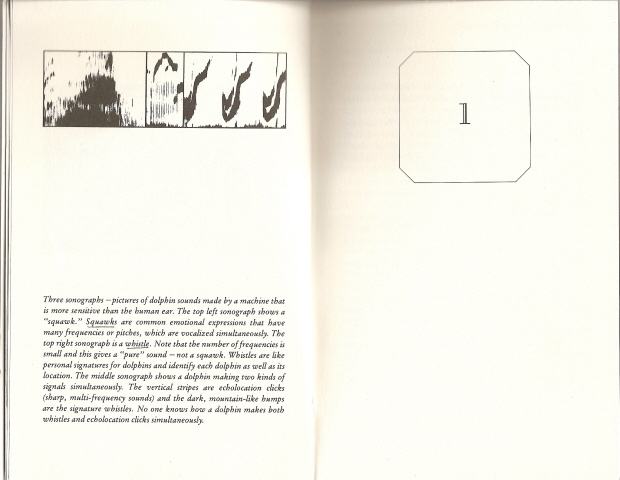 Two pages of photographs and explanatory text appear just before Chapter 1, as a kind of preface. 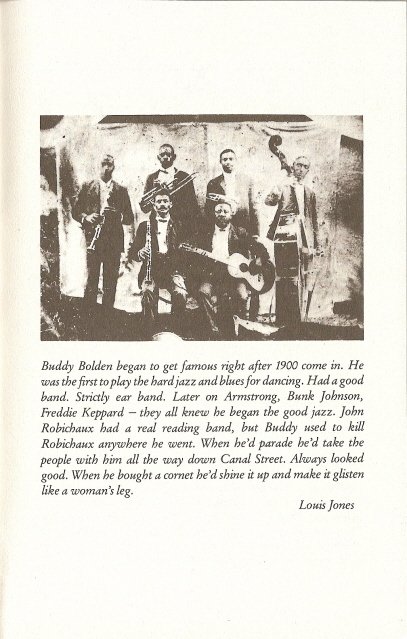 The first photograph is of Buddy Bolden’s Orchestra, sometime in the years right after 1900. In a minor, but interesting side note, there is some discussion in jazz circles which way the photograph should be oriented. I’m reading the popular Vintage paperback edition, which is shown at the top of the post, and I suspect that the image as it is used on the cover and inside this edition is, indeed, reversed. If not, a surprising number of the musicians would appear to be left-handed. 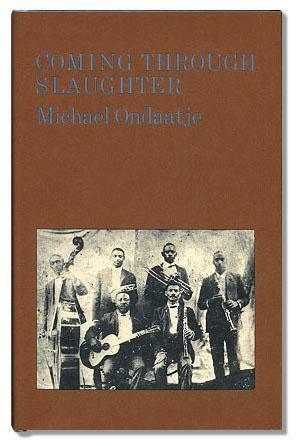 Later in the book, when Ondaatje lists the names of the musicians as they supposedly appear in the photograph, the positions of the musicians are the reverse of the way they are standing in this version of the photograph; Bolden is indicated to be at center rear left, not center rear right as in the photograph above. And, in fact, the photograph is printed in the opposite direction 1976 Canadian first edition, issued by Anansi. But it is the second photograph that is the real surprise. This image depicts is a series of three sonographs of dolphin sounds. On the left is what is described as a “squawk,” a kind of “emotional expression.” On the right is a “whistle”, which dolphins use to identify themselves and locate each other. The middle sonograph depicts a dolphin making both sounds. “No one knows how a dolphin makes both whistles and echolocations simultaneously.” I think the key to unraveling the meaning of this image comes halfway through the book in a quote attributed to Dude Botley, one of Bolden’s musicians. Then I hear Bolden’s cornet, very quiet, and I move across the street, closer. There he is, relaxed back in a chair blowing that silver softly, just above a whisper and I see he’s got the hat over the bell of the horn… Thought I knew his blues before, and the hymns at funerals, but what he is playing now is real strange and I listen careful for he’s playing something that sounds like both. I cannot make out the tune and then I catch on. He’s mixing them up. He’s playing the blues and the hymns sadder than the blues and then the blues sadder than the hymn. That is the first time I ever heard hymns and blues cooked up together. 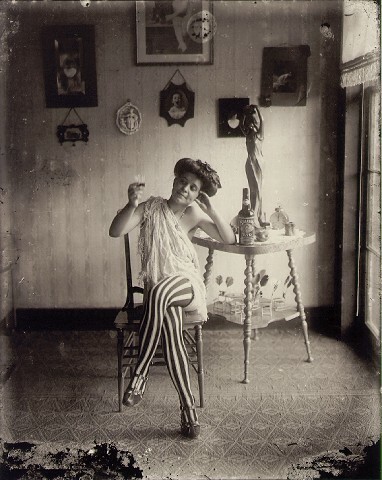 Bolden’s peculiar mix of blues and New Orleans funeral music is often cited as one of the origins of rag-time music, which became modern jazz, and it takes a poet to find an equivalent to jazz in the strange ability of dolphins to make two kinds of sounds at once.